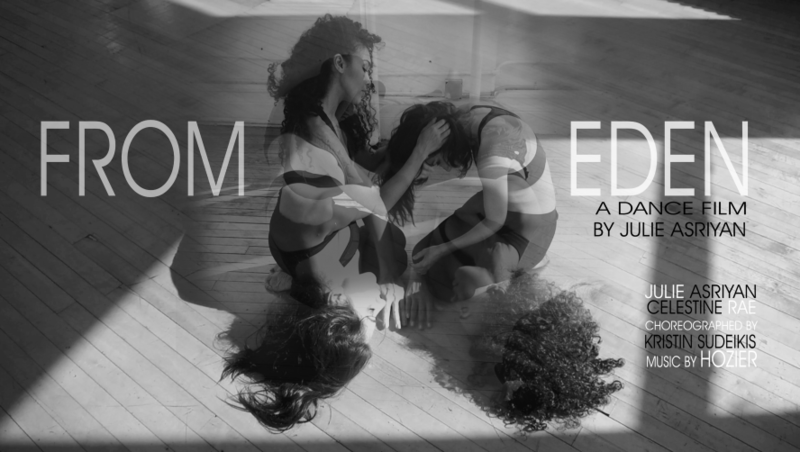 Tell me about the “From Eden” dance film. JULIE ASRIYAN: Well, I am an actor but my first introduction to the creative and performing arts was through music and dance. My parents are both musicians and my mom a dancer in her younger years so they passed on their love of expression through the arts to myself and my sister. I honestly cannot remember a time in my life that music didn’t light a fire in me that led me to a feeling of just needing to express it through movement. It is a magical, sacred space to find yourself in. That space of total freedom and connectivity with your own body. It’s not even always conscious. It’s just innate for me. I studied multiple disciplines of dance throughout my life and have always enjoyed the expression it gifted me. As an adult my focus shifted organically from dance to acting in theater and film. Acting is my greatest creative joy. I graduated from a professional actor’s training program at William Esper Studio in NYC and have since acted in films and staged productions as well as written, directed and produced works. But I always sought to find a way I can fuse my love of dance and acting and film into one creative expression without any limitation on what the work is “supposed” to be. I always had a problem with “supposed to’s” when it comes to creativity, really. This is where “From Eden” comes in. I found myself listening to the song “From Eden” by Hozier on repeat. It is an amazing record. Just the weight of it felt so right. It is both so dark in tone but light in it’s presence. And of course the serpent/devil and eden/virgin..those juxtapositions…I wanted to play with that idea. I began to dance to the record and began sort of choreographing and discovering characters within. I love that part of creativity, the discovery. I realized this is the perfect song for the sort of project I sought to create. 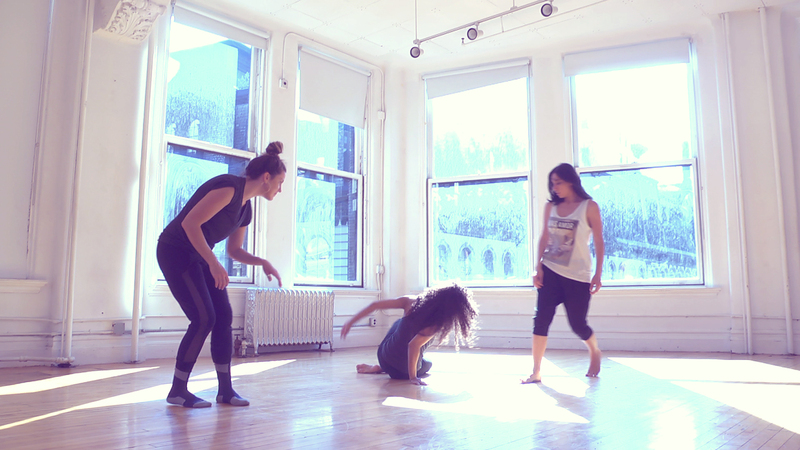 A dance film set to the song, which fuses concept and story, dance and acting into a piece of art. A piece of expression. 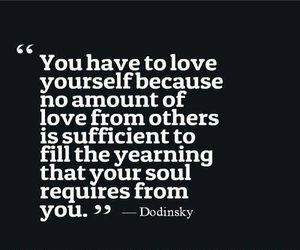 Duality as the central theme; inner demons/outer strengths, the serpent/eve, the temptress/the virgin, love/heartbreak, joy/pain…mirror images of each other. With this I went forth. What was the process like? From concept to creating, collaborating and choreography. JULIE ASRIYAN: I knew this would be a two person piece and the person I felt would be perfect to be my partner in this work is Celestine Rae. There is a kinship between us. Celestine and I studied together at the Esper Studio and she too came to acting by way of dance. I’ve always loved her grounded character, poise, unquestionable talent and devotion to the arts and we’ve worked together previously in other capacities but this would be the first for us in this form. I was so happy to hear of her excitement to be a part of this project, she too felt a yearning to reintroduce dance to her work. She was completely in tune with me from the very beginning. My next cause was to find the right choreographer for this piece. It was crucial for me to find a choreographer who works organically and intuitively. Someone who can understand that the relationship of the characters to each other and themselves is what was most important. I came across the work of Kristin Sudeikis and knew she was the one. Her enthusiasm and fine sensitivity for creating this with me was just a God- send. The last piece of the puzzle was the cinematographer. Dan Simon and I worked on another project together. I so love his passion for film. He was perfect for this because he understood immediately what I hoped to create in terms of tone and visual elements. He is so skilled both as a DP and editor in creating the composition and right visual style. And as an actor, he understand my passion for this work. When it came to developing choreography and the relationship I could not have asked for a more cohesive experience. Kristin and I vibed immediately and intuitively. She has a magnificent conscientious way of working with dancers/actors. Our work flowed naturally and clearly. Celestine was both incredibly receptive and giving. She was fully there, fully present in our discovery of the piece and each other. There was a lot of building we did outside of what ended up on film and it was so intrinsic to the creation. And Dan’s use of the space and introducing light and shadows as a major visual element was just perfect. What about this project attracted you? Why did you take it on? KRISTIN SUDEIKIS: The story-telling aspect of creating is infinitely attractive to me in every genre of art – music, dance, poetry, comedy, painting – I was drawn to Julie’s clear vision of the story she felt compelled to tell. I wanted to help her create that story in any way I could. Her clarity and commitment were equally compelling to me. Too, great taste in music, ha! CELESTINE RAE: I was attracted to the merging of two art forms that I love and respect immensely. Dance is indeed my first artistic love… And acting soon followed. Acting is my primary focus right now but I often miss my dancing years. I miss being able to express myself and convey a story solely through movement. When Julie reached out to me about the project and sent me the song, it was an instant yes. The song lyrics spoke to me as well. Julie shared her idea for the theme of the piece which was based heavily in love, longing, and the torturous relationships we end up in while chasing love… The irony and complexity of experiencing love in a space where there is also pain… This concept definitely resonated with me on many levels… And honestly reminded me a bit of the love affair I once had with dance. The indescribable beauty and love for the craft juxtaposed with elements that were indeed torturous – physically as well as mentally and emotionally. DAN SIMON: I was always interested in the idea of doing dance movies. I’ve filmed a few live dance performances and many music videos but never a dance piece staged specifically for the camera. There’s a very talented ballerina in my family and she has always been after me to collaborate on a dance film. When Julie asked me to be part of this I knew there were three very talented people involved so I knew I would have a good time and the product would be interesting. I also knew it would be a good introduction for me to test my eye on moving bodies through space. What could be more cinematic! I hope I can continue to do projects like this. What was the process like for you from concept to creation to working with EVERYONE. CELESTINE RAE: It was a breath of fresh air. Working with Julie was so inspiring. She is indeed a visionary and someone who creates under any and every circumstance. I’m grateful she brought Kristin on board. Kristin brought an openness and generosity of spirit to the room that she infused in her gorgeous movement. She encouraged us to find depth in the simplest of gestures. She reminded us this piece was about telling a story- not showcasing technique necessarily. We made some powerful discoveries during rehearsal and through improvisation. Dan was amazing to work with because I honestly forgot he was in the room at times. He remained a fly on the wall while we worked. After watching the film, it’s almost impossible to believe that he wasn’t in there setting up specific shots and running the show. What he was able to capture while being that fly on the wall is remarkable. This film is shot and edited beautifully! I’m looking forward to hopefully working with each of these artists again. DAN SIMON: I came in when they were in the process of choreographing and I observed their dynamic and the space. For me the process is similar to covering a narrative dialogue scene. It becomes sort of obvious what to do with the camera based on the situation, relationship and the light. And in this case also the music. It’s usually intuitive and I always trust myself, and Kristin and Julie had a philosophy and set up an environment where that could happen. The editing felt the same way. JULIE ASRIYAN: What we created in the end is exactly what I had hoped it would be. Mostly I love the fact that it now holds a life of it’s own. Many people have approached me with their own interpretations and understanding of the piece and I love that the most. When a work you create is found to relate and resonate and touch someone deeply, what’s better than that really?